Race 11 of the 2017-18 Season and Heat Three of the Summer and Season Point Scores, and the last race day for the year. Today’s event would take the form of a one day regatta to mark the occasion of the 126th Anniversary of the first event run under Mark Foy’s rules back in 1891 – ie 3 races from a handicap start on a 1 lap triangular course, with a point score system applied to determine an overall result for the day. Conditions were hot and humid in the boat park with the prospect of a cooling sea breeze to provide some relief during the afternoon. 8 skiffs were on hand for this event, most decided on carrying full size no.2 rigs, with a couple opting for slightly smaller configurations. The harbour was at its sparkling best but also very busy with the Sail Sydney regatta in full swing not to mention the additional commercial charter and recreational craft in action at this time of year. The course for the day would start off Clark Island with a beat into a NE breeze to Taylor Bay, a reach to Shark Island and square run to the finish off Clark Island. Skiff handicaps were reduced to 1/3rd of their normal making for a quick dispatch by the starter. Race 1 – Britannia was first away with the remaining boats soon in hot pursuit. The fresh breeze suited Britannia’s smaller rig and she reveled in the upwind conditions to lead at Taylor Bay for the tight main/jib reach across the harbour to Shark Island with Scot and The Mistake chasing hard. After the gybe mark at Shark the skiffs set spinnakers for a square run back to the start/finish line. Scot moved into the lead to win the race from The Mistake, Britannia (under ringtail), Aberdare (broken stay wire), Alruth, Australia IV and Tangalooma. Yendys suffered an unfortunate and terminal bow-down fill-up on the last run that ended their racing for the day. Race 2 – Similar conditions, breeze a bit fresher and a bit more left (NNE). Britannia started on port at the pin-end and carried on for a while before tacking onto starboard; the remaining skiffs started on starboard for a long leg to Bradleys Head, with some getting caught out by the wind shadow at Bradleys and/or other yachts negotiating the same corner of the harbour. Britannia was first to round at Taylor Bay and held a good lead for the leg to Shark Island, with The Mistake, Scot and Aberdare chasing hard. Britannia continued to lead for the final run (under ringtail) to win the race from The Mistake, Aberdare, Scot, Tangalooma and Australia IV. Alruth was a casualty in this race, when attempting to pinch to windward to sail above the cardinal mark on the eastern side of Bradleys, the run-in tide was working against them, they “brushed” the post with their mainsail and then it was curtains” as they rolled the leeward gunwale under for a terminal fill-up. 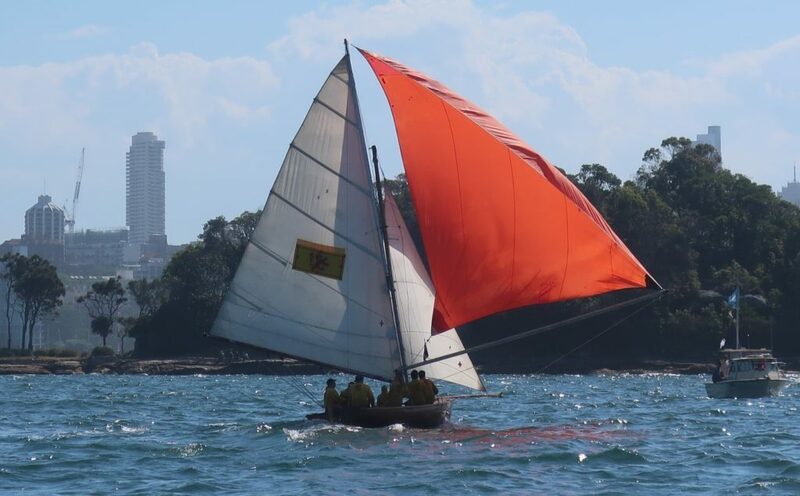 Race 3 – The breeze backed-off slightly and much of the harbour traffic dissipated as Britannia pulled off another port hand start at the pin-end. Britannia was first to round the Taylor Bay mark with Scot close behind, then The Mistake, Aberdare, Australia IV and Tangalooma. Scot moved into the lead on the reach across to Shark Island, and then held the lead for the remainder of the race with Britannia finishing in 2nd (under ringtail), The Mistake, Aberdare, Australia IV and Tangalooma. Overall – After the points were tallied up from the day’s racing, Scot and Britannia finished at the top of the table on equal points, then with the countback applied, Scot becomes the winner on the day. Well done to Greg Kay, Jamie Watt and the rest of Team Scot. Britannia takes 2nd place, then The Mistake, Aberdare, Australia IV and Tangalooma on equal 5th (tied score/place), then Alruth and Yendys. With thanks to our on-water support team of Barley, Russell, Roy, Peter, Adrienne, Chuck, Louise, Rob, Bill, Glen, Janis and Bill, post-race support from Ross, Coral and Margot, Angove Wines and the rest of our tireless volunteers, along with the dedicated team at Rosman Ferries. We look forward to seeing you down at the Squaddie next year – ie next race 13 January 2018.